Learn the difference between society and charitable trust in India. I present a trust vs society comparison of NGOs so that you can easily decide which one is better for your social work. Recently I had written about how to register a trust and the process of registering a society in India. I have written several articles on the subject of NGOs in India. Today, I though that I should present a summary of differences between trust and society. These two are the main types of non profit organizations in India. Often people ask “Trust or Society, which is better?”. There is no universal answer to this question. Both society and trust have their own benefits and drawbacks. You should spend some time considering both these options. The following comparison table should help you in deciding which is better for your circumstances and objectives. Nature of control One man control, i.e. Settler Democratic system. Decisions are made by voting. Power struggle may ensue. Some people also gets confused about a trust and a foundation. I have written a separate article to answer this question. I hope this table of differences would make several things clear in your mind about differences among Trust and Society. For more specific information you may read more articles as listed below. In case you still have any questions, please ask them in through the comments section. While asking questions, please write in details. Also, please do not ask questions without going through all my relevant articles. You will find most of your answers in one or the other articles. Thank you for using TechWelkin! Is it possible to convert a trust into a society? I don’t think it is possible to convert a trust into a society or vice versa. A few Telugu friends residing in Noida ( NCR) opened a Bank account in the name & title ” NOIDA TELUGU SEVA SAMITHI, NOIDA” in year 2013 and carrying out socio-cultural activities with the donations collected from like minded people; mostly Telugu people. We have so far not registered and so haven’t got PAN card. Bank deducts 20% tax on FDs taken with surplus. We want to register as Trust for simple reason of convenience and obtain PAN & eligibility to receive donations under 80 (G). We intend to have 7/8 trustees. Can we have trust deed to make it democratic of equal rights to all members? Yes you can make such provisions in the trust deed. Hello Mr. Lalit…. Thanks for your information. I would like to get some clarification. we, a group of 6 friends, are contributing a fixed amount monthly with the objective of investment in some profitable activity, so as to procure some assets in the future that is common to all the members. This is completely for the future financial benefits to the members with no plans for any charity. In this case, pls suggest me under which category our group can be registered (trust/society/foundation/or any other), so as to make all the monetary transactions legal. Thank You…. I can not give you any opinion because this article is about public charity. If your purpose is to make profit, you should consult a lawyer to know how to go ahead. I am an NRI,Me and my like minded friends have started a small organization for NRIs in our village.We are trying to register as a society ,do some business and spend 60 percent of the profit for charity and 40 percent for the members.But when we submitted the bylaw for registration, they said from collectrate that if it registered as society you can not draw profit out from that.Anyway we are going ahead as charitable society. But still we have the plan to do business. We are in a confusion now.Could you please suggest an option for us to do business and charity and give some profit to our members? You can not take any profit from a charitable society or trust. Your main motive is business -so you should register a company. Also register a trust or society. Do business through you company and donate 60% of profit to the trust/society so that it can do charity work. Can a government officer/bank employee/lawyer form a non-government organization, welfare society, or trust in India during his service? Read our article on this topic. Dear Lalit ji, I have one small question. 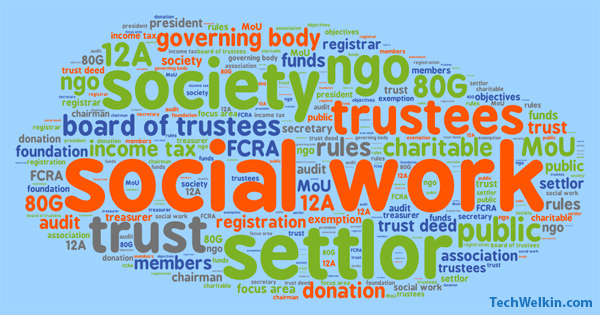 Can I use ‘Trust’ word in my NGO’s name while registering as society? Hi Atul, I don’t think there is any problem in that. Can I register a trust on my share of property/home if civil case is going in the court among shareholders of that property? A lawyer can answer this question better. But I guess it is not advisable to register a trust office on a disputed piece of property. Thanks a lot for such an excellent article on the difference. I read your other articles too about registration of trust and society. They are extremely useful. I have a query. We are a group of friends planning to contribute a monthly amount and donate that amount to less privileged orphanages/homes. To avoid any tax implications to an individual’s bank account we are planning to register a trust or society to do this. My friends are located across India. Can you please advise what is the recommended option here ? Or do we need to register at all to do this kind of donation? Well, it is recommended that you either register a trust or society for this purpose. There is no “recommended option” as to whether you should register a trust or a society. It depends on your organizational needs. In both cases you will open a bank account, apply for a PAN, apply for 80g and 12a. This will save you from paying Income Tax as you will not be directly receiving money as an individual. As an individual, you should not accept monetary donations but if you do -then you will have to pay Income Tax on the donations received -even if you use the donations for charitable purpose. Dear Lalit, thanks very much for this information. For long time I was in search of such an article providing clear information. A trustee can not take anything from trust fund just because he/she is a trustee. But if the trustee is doing some professional work for the trust, then he/she can take a reasonable reimbursement. Yes you can. There should not be any problem in using the word Foundation in the name of a society. Firstly appreciate your help to her everyone here. I have an educational society registered in 2010. Since then there are no activities conducted on this society due to various reasons. Now that we wanted to start, we wanted to apply for 80G for the registered society. Please help me with all what is required for getting 80G for our society. Also, the society is registered in Andhra Pradesh before its bifurcation. We are helping 4 students with their education in the bifurcated state Telangana. Can we continue on the same society or should we register one more in the new state. Please help with your knowledge. Hi Jay, I am not sure about how bifurcation of Andhra Pradesh has affected your soceity’s ability to work in Telangana. You should contact the registrar of societies for this. As for 80G exemption certificate, I have an article on that. You can read it. We, five friends together, have decided to contribute some funds out of our salary per month that we want to spend on education for deprived children who have not gone to school or left it incomplete. We don’t want to open any office for it but there is a need of a bank a/c for it. Is it mandatory to name our group? Please let me know the procedure to have bank a/c open with a bank. And also do we need to have trust deed. Hi Rajeev, you should go to the bank of your choice and ask them about how to open an account. May be you and your friends can open a joint bank account and that’s it. If that suffice your purpose, you would not need to register an NGO. I have gone thru all of the above. Can u guide me one question. Suppose five friends have made one trust and after some years they want to make individual trusts, then the original trust fund and property etc can it be divided equally among them i.e. in the name of their individual trusts. No, this is not so straightforward! The funds that you collected were given to you to carry out a certain social work. If your trust deed allows, you may donate your trust funds to the other trusts with similar objectives but you can not just divide the funds like you said. Great work brother… I, truly appreciate your research and information and thanks for sharing the same. Dear Lalit Sir, Why the registration for society is so complicated and tough compared to Trust which is easily done though , in my opinion, both trust and society are enjoying almost equal powers . Why then people opt for society registration and not trust. Durga Prasad ji, people opt for a Society when they want to have a democratic structure. That is the main reason behind making a society. Is it possible to get an NGO registered both as a Trust and as a Society? If Yes, then would it be better to get it registered as a Trust first and then go for the Society? If NO, then why? You can not register an NGO both as a trust and as a society. The reason is because there is no need to do so! A registered public charitable trust wants to sell utility articles to public at large for which registration under vat/cst etc.are required. However proceeds out of this selling activity will not be distributed among trustees but will be treated as receipts and used for further welfare. Can the trust do so and accordingly how should the deed be altered so as not to invalidate the nature of its existence. A trust can have “business income” of upto Rs. 10 lakh. If your income by selling utility articles go beyond Rs. 10 lakh, you may have to pay income tax on that. First of all thanks a lot for this good info. I have already registered a society under 1956 act and a school is running under this society. I need to ask you whether I can change this society into a trust? No, you can not change a society into a trust. You will have to register a new trust. In maharshtra if you register a Society then that society gets a Trust Registration also automatically. My Society has Trust registration also. Pls can you tell I can enjoy which type of benefits either of Trust or of Society. As it is registered as both. I did not know that in Maharashtra, a society automatically gets registered as a trust also! Now, I am not sure what benefit they give to you because apparently Maharashtra act is specific. You should talk to a lawyer in Maharashtra who knows about the act. I am interested in providing legal aid to the poor and organising awareness camp for them. Which should be best option for me trust or society? Trust is better or society is better —it does not depend on what social work you want to do. It depends on who are the people involved. I have written about the differences between trust and society, you should be able to make decision. Please let me know a society registered under the Karnataka societies registration act 1960 can be a trustee of the trust. And Can a trust registered under indian trust act 1882 be a member of society. Well, as far as I know, it is not possible. Trustees and governing body members are individuals -and not organizations. But you may consult a good lawyer about this. If i registered trust in city patna, bihar state then it be registered at all India level or i have to registered it from some particular state to work at all india level. And the name of trust is also registered. Or some other charges or process to registered name at india level. That no other origination use my trust name. Trusts work at all India level. You don’t need to register it separately in different Indian states. I do not have enough information about exclusive rights on the name of the trust. May be a reader will shed some light on this matter. Actually I came to know that this society was made by old trustees with other members to make a Governing body of the trustee, while our this trust was made in year 1945 by registering a deed in Kolkata and this Society was made in the year 1994-95. After holding the office of Trustees, we removed the Governing Body and taken full control of the trust. Now my question is how we can rectify this error? What will be the effect of this error on us? As we have given a part of our property on lease to a school and by filing one PIL, one person has made party to the Society in that lease matter case, while only we trustees has signed on the lease agreement paper. Ramesh ji, you need to speak with a good lawyer about this issue. Nice Article. I want to ask that is it which form will be better if we want to get foreign funding, trust or society? Your articles are very very helpful. But I have a doubt in my mind. I want to educate the children who are with intoxication (addicted). My project is to open a small school & nursing home in villages of my district for poor, labour child Family . And a full facilitated school & Nursing Home in my town for addicted children. Which one will be perfect for me Trust or Society? According to funding either public or government funds. Hello Aamir, there is no difference between trust and society as far as possibility of funding is concerned. If you do the good work, you’ll find funding. Your articles are very much helpful. I am running a trust. But my trustees want to kick me out of my organization. I need your help. Help me please sir. This is your trust’s internal matter. I am afraid I can not help in this regard. You should take advice from your lawyer. I have a question. If any NGO wants to other works besides trust deed… like environment. And public avairness. Can they do? Well, no body stops you from doing any social work. But technically, you can not (and should not) utilize trust funds for the activities that are not mentioned as objectives in the Trust Deed. People donate to you for the work that is mentioned in the trust deed. One more question from me. If my trust deed is related to education. And after long time my trust is running well in educational field. If we also want to do other work not related to our trust deed, like environment and pollution or other works, can we do later. No, you can not (and should not) work outside the objectives of your trust deed. If you want to work in other areas, you should register a new trust. I want to educate the children who are with intoxication (addicted) My project is to open a small school in 20 villages of my district for poor and labour child. And a full facilitated school in my town for addicted children. Which one will be perfect for me Trust or Society? According to funding either public or government funds. There is no difference between a trust and a society as far as prospects of getting funds is in question. You get funds if you do good job. Period. Hi Lalitji very interesting article. Brijesh, social work is all about putting one’s own resources to the welfare of society. Surely, one can seek government’s help but essentially it should mainly be about making good use of resources that are there at your disposal. If you’ll do good work, help will come. If you’ll just keep on thinking about government help, then probably it will be too late to begin. So, my friend, just go ahead and begin the good work. Details provided by you is really precious. One more query is whether a trust is entitled for any grant/donation if the husband holds position of Secretary whereas wife is President in the same trust while treasurer is not a relative either of the two ? Yes, in case of charitable trusts, family members can become trustees and hold whatever positions agreed among the board of trustees. You can also apply for government grants but agencies are free to refuse grant if they are not satisfied with your work or organization. I have gone through your article and find it very informative. I would like register a not for profit organization to mainly promote education among socially and backward community and also promote games and sports in the area like Club. Confused whether to register under Trust or Society??. Kindly Help me out. Your comparison of Trust and Society gives a clear picture. Thank you for making things so simple. On reading your article, I have immediately decided to register our institution under trust. We are running a training institute, IDEAS ( Institute to Develop English, Attitude & Soft skills). If time permits, visit our website, and pass on your suggestions. All the very best to all your efforts. Many thanks for your article, well written and very informative. I have a query related to the legal status of a “trust”. We want to enter into a contract with a Trust and as per our rules, we can enter into contracts with “legal entities”only. Is a “Trust” legal entity? Yes, a registered trust is a legal entity which is bound by its own constitution (called Trust Deed). Please note that the trust must be a registered one. If you’re entering into a legal contract with a trust, you should check their Trust Deed and see if there is any clause that you may not like. Later on, if the contract is breached, you can drag the Trust to courts. But remember that a Trust is allowed to do activities which is permissible in the Trust Deed. So, it is important for you to check the Trust Deed. Hope it helps. Many thanks. Indeed it is very helpful. I want to form an animal welfare ngo. Kindly do suggest which is better for this trust or society? Would i be able to get donation in trust? Dear Ananya, I have written these articles exactly for the purpose to let readers know all the details about Trust and Society. Please read the articles and ask very specific questions, if you have any. I along with 10 more guys from my village are planning to start a society for development of our village. We are not sure to register a society or trust. Also most of us don’t have pan cards. We want to implement few development schemes in village hence need a registered body. Can you help if we should start with society or trust. Also what all things that we need to initiate are goals. Hello Chandrabhan, I can not go in details but I feel that you should register a Society. You can get the PAN card issued in the name of your Society. For more details and chalking out finer steps, I would suggest that you consult a good lawyer. I want to form a non profit organization for improvement of science and technology development where various institution across the globe will be member and participate for improvement of science technology development by assisting training, R & D Set up and there will be some other specific objectives..I am confused which I should form society or trust or company, but I am afraid if it is formed as society under society act and I may be thrown by voting of other members and my objective will not fulfilled but if I formed as trust or company then democracy may not be there. Well, Sambhu ji, I guess registering a Trust should be good for you. No one can kick you out of your own Trust. Moreover, in Trust, you are free to make decision making as democratic as you want. Societies HAVE TO be democratic and Trusts CAN BE made democratic. But I understand Trust is less credible to take grant from govt, corporate and foreign companies. Trust will allow me to open office anywhere ? A lot of big NGOs have been registered as Trusts and they get lots of funding for their objectives. So, it’s not that Societies get better funding. I would suggest that you find a good lawyer who can give you more detailed advice. I want to help of acid victim. what is better to help them by collect crowd funding trust or ngo? kindly do let me know the which do i needed to registers ,,,as per my deed,,,i would like to take few children form the poor community and give them tution and make them to educated by staying with us full of year,,,and we like to provide them food, and helth care as well,by collecting nationa; fund these are the deeds we wanted to do,,,so under which one do i need to go for registered as a SOCIETY, trust or non profit org. Type of organization is not really linked with what you want to do. You can established either a trust or a society -both will work fine. Great Article by Lalit, Wish him all the success in his life. i would plane to organized a welfare organization to help abundant, uncared, unloved people and offer compassion and aid to those in need. reallly we thanks for making our doubt to be clear. It would be nice to know how the government (state and central) looks at these two entities from the point of view of giving aid (funding), subsidies, etc. I know that private funding is harder to receive by trusts but don’t know if that’s true for tax-exempt trusts. How it can secure the employees if it is trusty and society? Thanks , very important information given. Pl.support us all time to com. Family members are not allowed to be part of the society? I have registered an education trust at Thane Maharastra. How to make it valid for all India so that school can be open any part of India on the same Registration Number. Trusts are valid all over India by default. You don’t need to do anything. We have a Trust registered under Karnataka Societies Act. We also got registered under section 12A of Income Tax act, 1961 in the same state. Now we want to transfer its jurisdiction in Delhi. So do we have to get it registered again in Delhi Societies registration act? Trusts can function on all India basis. You don’t need to re-register your trust in Delhi.